One for three: With ports of 3, it\'s enough to share with friends and families, for outlet-limited situations. Compact size makes it perfect for trips. Powerful and Efficient: can charge 3 devices at once without diminishing the speed, just as your original charger does. Charge fast: Smart tech automatically detects and provides a most efficient charge (up to 2.4A per port) to every device connected. QC 3.0/2.0 not supported. Solid and Reliable: Certified by RoHS and CE, the well-constructed charger ensures long-time using. Each port with dedicated surge protection and short circuit protection keeps you and your device safe. 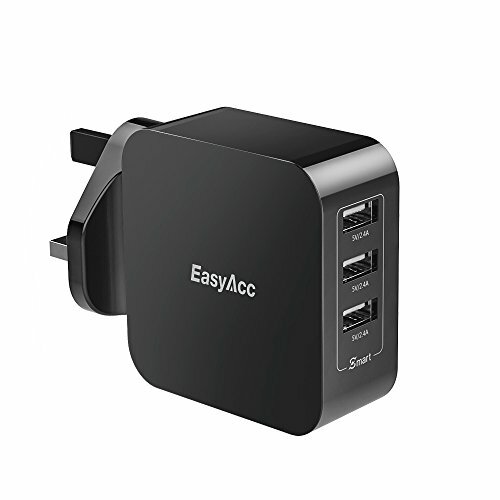 What You Get: EasyAcc 3-Port USB Charger, user manual, our 18-month warranty and friendly customer service.